See Whale or Come Again For Free! Join us to explore the San Juan Island aboard one of our new fast boats. See an abundance of whales and wildlife including killer whales, humpbacks, sea lions, seals, dolphins and more. Tours are 3 to 4 hours long and lead by trained naturalists. A day in on the water in one of the worlds most glorious boating destinations. Great for all ages. 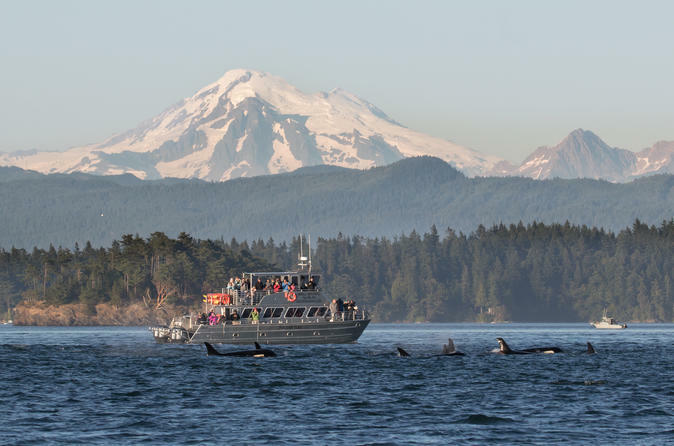 Depart from Orcas Island to Enjoy the wildlife and whales of the San Juan Islands. Tours depart once a day at 1 pm in the Spring and Fall and twice a day in the Summer at 11 am and 3 pm. Please check-in 30 minutes prior to departure. Shuttle Service is available upon request from the ferry landing. Tours are between 3 and 4 hours long and are lead by trained naturalists. See the regions whales and wildlife such as Orca also known as Killer Whales, Humpback and Minke Whales. These tours are guaranteed, meaning if you don't see whales you can come again for free. Snacks are available on boards and in the snack shop before you depart. Come out and experience the San Juans!